These tools will serve as a key part of our advocacy to legislators and their constituents who care about the environment. Download and post them on Twitter, Facebook, or Instagram to explain why you support including congestion pricing in this year’s budget. Don’t forget to tag us @nylcv in your post! The transportation sector is the number one source of greenhouse gas emissions in New York State. 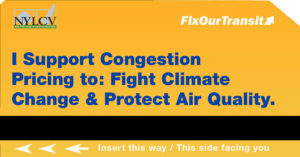 Congestion pricing will not only reduce congestion and improve air quality but also help the State achieve its ambitious climate change goals and raise new revenue for the MTA. 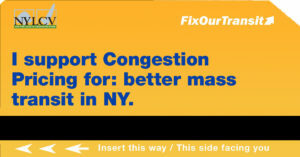 With the help of our members and everyday New Yorkers like you, we are raising support for congestion pricing among our elected officials as we get closer to the budget deadline of April 1st. Congestion pricing would impose a toll on vehicles entering the city during specific times in predetermined traffic-heavy areas such as Manhattan 60th Street and below. This would secure funding – in a lock box – to improve public transit, encouraging New Yorkers to leave their cars at home and reduce transportation emissions. It would also decrease traffic and pollution, helping to improve air quality and public health. Research shows that congestion pricing could decrease traffic congestion by 13% and prevent 2.1 billion pounds of greenhouse gas emissions per year in New York. That is equivalent to emissions from 740,000 passenger vehicles or powering 600,000 homes. After congestion pricing was implemented in Stockholm, researchers found a 50% drop in childhood asthma rates and a 15% drop in particulate matter emissions.